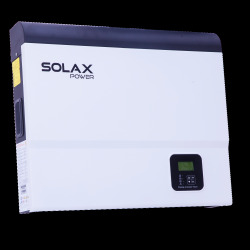 Buy your SOLAX inverter at the best price for self-consumption in our ALMA SOLAR online shop. With the SOLAX POWER inverter, solar panel self-consumption is really very simple. The SOLAX inverter is designed for self-consumption in a very simple way. Indeed, just connect the SOLAX inverter to the battery and it works. The inverter will recharge the batteries in the daytime to discharge them at night when you need energy. You optimize your autoproduction and increase your performance. In the long term you reduce your electricity bills with your solar panel. 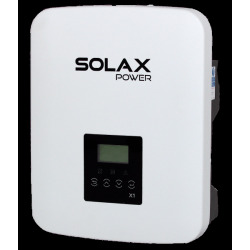 Solax manufactures inverters specially adapted for solar self-consumption. SOLAX POWER offers a wide range of hybrid inverters connected or not to the network. Intelligent, the SOLAX hybrid inverter detects the cheapest energy source (photovoltaic, battery or network). Economic, SOLAX POWER has adopted a low-cost strategy to equip as many homes as possible with photovoltaic energy. Connected, the inverters send by free WIFI the data on Internet to supervise and analyze the performance of your photovoltaic installation. The start-up voltages are fast so you can get performance in your photovoltaic system.